Entertainment 88 provides Live Music for Weddings and Parties, Corporate Events and Cruise Ships. 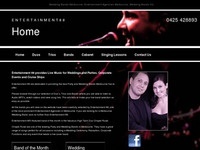 Entertainment 88 are dedicated in providing the best Party and Wedding Bands Melbourne has to offer. If you are looking at booking some live entertainment in Melbourne then give Entertainment 88 a call and let them make your event a success. I have gone through the website details. I am quit impress with the profile. It looks fantastic. It’s sounding just fabulous high technology music and entertainment. My Big Bro is getting marry at next year. We want great fun and enjoyment. I would like book band, music and the entire party entertainment from Entertainment 88. I am dam sure that it will be definitely lost of fun 7 entertainment.